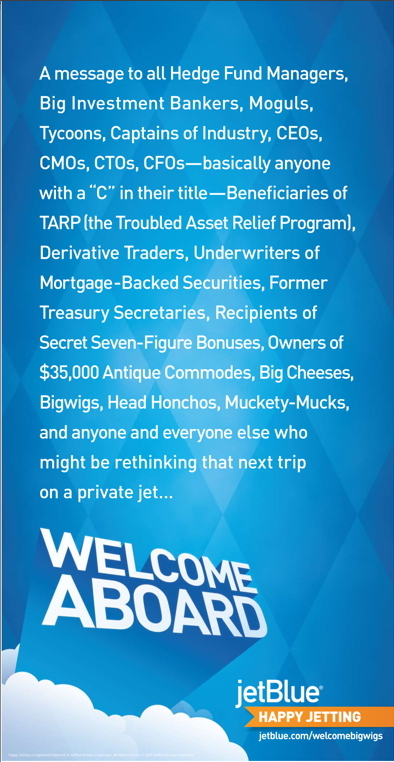 jetBlue's released a big wordy poster, calling out all the guys that used to be too good to fly with others: C-suite execs, "Underwriters of Mortgage-Backed Securities, Former Treasury Secretaries," et cetera, et cetera. The bottom of the ad pithily reads "WELCOME ABOARD." 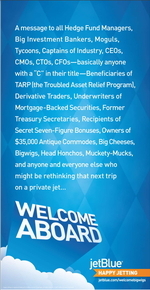 There's also a separate section of the jetBlue.com site labeled "Welcome Bigwigs," which details the PERKS! everybody on jetBlue gets. The WELCOME ABOARD, FORMER CASH-MONEY BALLERS! * effort is part and parcel of its ongoing Happy Jetting campaign, which loves itself some stencil clouds and ALL-CAPS. * This is a satirical embellishment of the actual jetBlue "Bigwig" campaign and is not intended to suggest jetBlue actually said that. Poo you, lawyers. The ad really left out the biggest potential market of all! How about Nancy Pelosi and other jokers in Washington who commute on a 757 every weekend to their homes on OUR dime????? ?